There have been significant developments in the state of psychological, neuroscientific and behavioural scientific knowledge relating to the human mind, brain, action and decision-making over the past two decades. These developments have influenced public policy making and popular culture in the UK and elsewhere – through policies and emerging social practices focussed on behavioural change, happiness, wellbeing, therapy, resilience and character. Yet little attention has been paid to examining the wider political and ethical significance of the widespread use of psychological governance techniques. There is a pressing and recognised need to address the behaviour change agenda in relation to how our cultural ideas about the brain, mind, behaviour and self are changing. This book provides a critical account of existing forms of psychological governance in relation to public policy. It asks whether we can speak of a co-ordinated and novel shift in governance or, rather, whether these trends are more simply pragmatic policy tools based on advances in scientific evidence. With contributions from leading scholars across the social sciences from the UK, the USA and Canada, chapters identify practical, political and research challenges posed by the current policy enthusiasm for particular branches of affective neuroscience, behavioural economics, positive psychology and happiness economics. 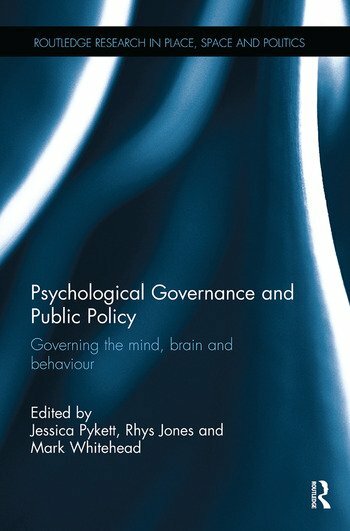 The core focus of this book is to investigate the ways in which knowledge about the mind, brain and behaviour has informed the methods and techniques of governance and to explore the implications of this for shaping citizen identity and social practice. This groundbreaking book will be of interest to students, scholars and policy-makers interested and working within geography, economics, sociology, psychology, politics and cultural studies. Introduction: psychological governance and public policy. Jessica Pykett is a social and political geographer at the University of Birmingham, UK. Rhys Jones is Professor of Human Geography at Aberystwyth University, UK. Mark Whitehead is Professor of Human Geography at Aberystwyth University, UK.